I was unaware of this magazine. I am very excited. Thank you for the free posters. 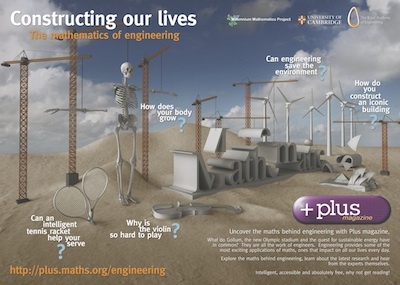 thanks in advance for the Maths of Engineering poster. The poster request have to go through the form above. If you fill it out we'll send one to you! I am very excited to learn of your mag :o) My husband is a construction manager and his dad is an engineer (retired now). I wanted to say thank you for the free posters to print ourselves. That helps ensure it getting used. You were unfortunately put on one of those 'freebie' sites. We found you on "thekrazycouponlady.com" and so you will continue to get bombarded if you print out more. The crazy ones give us all a bad name but I wanted to thank you so much for all your free at home info! Any idea on when they will be back in stock??? I was just wondering if you plan on getting this back in stock soon...I would love one! Not yet, but we'll announce it on plus as soon as we know! I would love a set of these posters to liven up my classroom and provoke discussion. Too many students ahve no idea why they are learning maths.